Council Directive 93/94/EEC of 29 October 1993 relating to the space for mounting the rear registration plate of two or three-wheel vehicles (3) has been substantially amended (4). In the interests of clarity and rationality the said Directive should be codified. Directive 93/94/EEC is one of the separate Directives of the EC type-approval system provided for in Council Directive 92/61/EEC of 30 June 1992 relating to the type-approval of two or three-wheel motor vehicles as replaced by Directive 2002/24/EC of the European Parliament and of the Council of 18 March 2002 relating to the type-approval of two or three-wheel motor vehicles (5) and lays down technical prescriptions concerning the design and construction of two or three-wheel vehicles as regards the space for mounting the rear registration plate. Those technical prescriptions concern the approximation of the laws of the Member States to allow for the EC type-approval procedure provided for in Directive 2002/24/EC to be applied in respect of each type of vehicle. Consequently, the provisions laid down in Directive 2002/24/EC relating to vehicle systems, components and separate technical units apply to this Directive. The objective of this Directive is not to harmonise the dimensions of registration plates used in the various Member States. The Member States should therefore ensure that protruding registration plates do not constitute a danger for users, without, however, this requiring any modification with regard to vehicle construction. This Directive shall apply to the space for mounting the rear registration plate of all types of motor vehicles as defined in Article 1 of Directive 2002/24/EC. 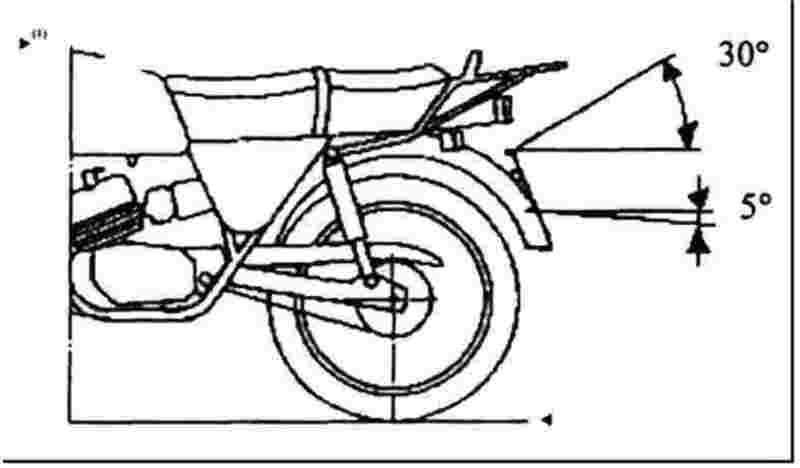 The procedure for the granting of EC component type-approval in respect of the space for mounting the rear registration plate for a type of two or three-wheel motor vehicle and the conditions governing the free movement of such vehicles shall be as laid down in Chapters II and III of Directive 2002/24/EC. if the space for mounting the rear registration plate complies with the requirements of this Directive. 2. Member States shall refuse to grant EC type-approval for any type of two or three-wheel motor vehicle on grounds relating to the space for mounting the rear registration plate if the requirements of this Directive are not fulfilled. Directive 93/94/EEC, as amended by the Directive listed in Annex II, Part A, is repealed, without prejudice to the obligations of the Member States relating to the time-limits for transposition into national law and application of the Directives set out in Annex II, Part B. (1) OJ C 324, 30.12.2006, p. 11. (2) Opinion of the European Parliament of 25 September 2007 (OJ C 219 E, 28.8.2008, p. 66) and Council Decision of 22 June 2009. (3) OJ L 311, 14.12.1993, p. 83. The provisions for passenger cars as set out in Council Directive 70/222/EEC (2) shall apply. the plate can be positioned within the longitudinal planes passing through the outer extremities of the vehicle. may be inclined by not more than 15° from the vertical, with the vehicle unladen, when the backing plate for the registration number faces downwards. No point on the space for mounting the registration plate may be more than 1,5 m above the ground when the vehicle is unladen. No point on the space for mounting the registration plate shall be less than 0,20 m above the ground or less than the radius of the wheel above the ground if that is less than 0,20 m, when the vehicle is unladen. The space for mounting the plate must be visible within a space bordered by two dihedrals: one with a horizontal edge defined by two planes passing through the upper and lower horizontal edges of the space for mounting the plate, the angles of which in relation to the horizontal are shown in Figure 1; the other with a perceptibly vertical edge defined by two planes passing through each side of the plate, the angles of which in relation to the median longitudinal plane of the vehicle are shown in Figure 2. (2) OJ L 76, 6.4.1970, p. 25. EC component type-approval has been granted/refused (1). (OJ L 311, 14.12.1993, p. 83). (OJ L 118, 6.5.1999, p. 32). if the space for mounting the rear registration plate complies with the requirements of Directive 93/94/EEC as amended by this Directive. 2. With effect from 1 July 2000, Member States shall refuse to grant EC type-approval for any type of two or three-wheel motor vehicle on grounds relating to the space for mounting the rear registration plate if the requirements of Directive 93/94/EEC, as amended by this Directive, are not fulfilled.’.